Russian guys makes knives made of sapphire. These knives cannot be discovered by any sort of metal-detector, they have none metal parts at all. Their blades are being made from artificial sapphire, the same material that is being used to make non-scratchable watches by leading Swiss brands. Handles are made of the bone. Only diamonds exceed it in the hardness, so anybody can easily make his name carved on the airplanes bull’s-eye airplane window. 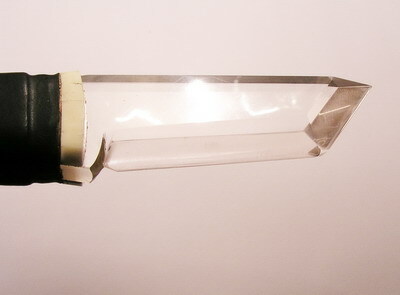 It scratches glass without any difficulty and can be sharpened only with special diamond whetstone. Wouldn’t look good if you were searched in a airport and that found on you. Where can you buy one of these? The only ones I could find in the states (in a few minutes of searching) were for machining – not hand knives. Yeah, but what if you wore it around your neck like a necklace? Yeah but… what if it cut your throat or upper body? Isn’t it hella sharp? I collect knives, and would love to add this one. Where can I order one, and how much does it cost? oh guys, it seems that the only thing you are thinking of is how to organise a terrakt.. i think this “knife” is expensive enough to not be taken by hooligans on the plane flying to US and A.
for example if you care about your right to use your knife anywhere you want. Lol! I don’t think you have many rights when it comes to taking knives on planes. Well this makes me feel safe. who makes this? how can I contact? I would rather take a snake. On a plane. I wouldn’t take no muthfukin snake on no muthafukin plane! Ceramic blades contain no metal—they’re made of a ceramic material called zirconium oxide. These blades are very hard and require little to no maintenance of the blade, and they’re a good choice if you’re looking for a lighter knife. However, ceramic knives are not as durable as steel knives (I’ve seen broken ceramic knives) and must be sharpened with diamond tools. Also, you should only use ceramic knives on a cutting board, as they are hard enough to cut your countertop or scratch the glaze of your dinner plates. It’s very stypid thing. I thik, it’s very expensive for people, who like carve your’s name into the window of a plane. 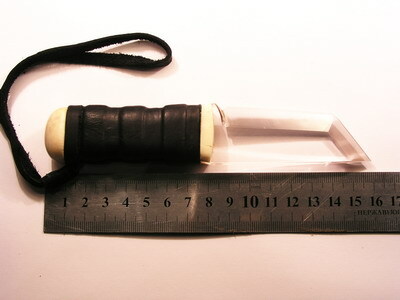 And what will you do with this knive agains realy danger? Ofcourse, if you have some useless money, you can buy it like a toy. But it’s realy toy, no more, listen your mind! this looks pretty decent. i’d love to buy one. but where at can it be found? Raven from Snow Crash anyone? exactly . . . yay for nerds. Any airport with high security requirements is already no longer relying on metal detectors. They use density detectors to locate “bad” objects that are tense, like impact weapons made of plastic or non-ferrous metal. 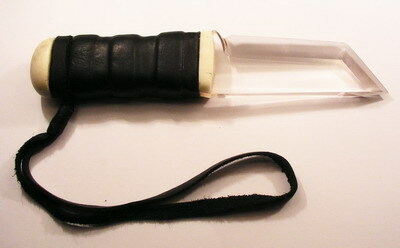 They also find knives like this, or ones made for YEARS now out of carbon fiber, acrylic, or G-10. This is not a new threat, and the counter-measure already exists. Exactly what I was thinking… sweet. I wonder how many of these knives we could buy for 350+ billion? Oh, that’s our future being sucked the airplane window now. psh, can’t we just kill the pilot with a drinking straw a rubber band and a paperclip like mcgyver would? no only Kyocera, many vendors. because a plenty of equipment made from saphire today. from lightbulbs to scientific equipment and … bullets. I don’t read Russian, but the creator seems to be an artist, not a weapon maker. Artificial sapphire may be cheaper than natural sapphire, but it’s still very expensive. I found a razorblade online for $650, and they charge $450 to resharpen it. 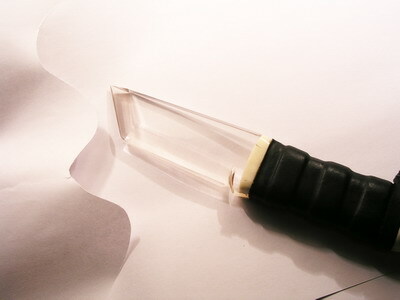 Are you sure the photo shows a knife blade made out of sapphire? It looks to me like a letter opener constructed out of pexiglas. I say this because, I made one of these, along with the other students in shop class, back in grade 8. You cut the pexiglas, then buff it and sharpen it. There may indeed be sapphire knives but honestly this isn’t one of them. I didn’t find the narrative particularly helpful. But, if I had some discretionary income to spend FAST, before some new tax “Change©” devoured it for me, I would buy one of these (an actual sapphire knife) while I still could. You can bet there are already hysterical legislators wetting themselves over this knife. Some may remember the fabled “Invisible Plastic Hand-gun” hysteria a few decades ago. Now there will be more of that, over “invisible” knives, even though they are not invisible. Hoplophobia knows no limits to absurdity. Best regards. Of course we could already have gone old school and carved knives out of bone anyway, and density sensors would read them as similar to skeletal structure anyway. To do damage they only have to be harder than flesh, which bones are. If you just want to scratch windows you’re simply wasting time. Pfft… You can always make a knife in the bathroom by breaking a CD for the blade and taping it to a piece of wood that would serve as a handle. It is very expensive blade. btw, airplane windows are not made of glass… so it’s easier to scratch than you think. no expensive safira knifes required. tint the blade pale cyan and i’d be all over it. Where can Me purchase large box of these?? Why would people need a knife to scratch a window. Any married woman usually has a freaking diamond on her hand that can scratch glass pretty damn easy. I think A knife wouldn’t pose that much of a treat in an airplane, there are Air marshals on every plane and they have guns..